This walk begins where the old and new main lines meet at Factory Junction in Tipton and takes you through the heart of the Black Country. The start is inauspicious with only derelict land in view. A kink in the canal marks Bloomfield Junction, formerly at the southern end of the Wednesbury Oak Loop that circumnavigated Coseley Hill and served mines and major ironworks including Bloomfields, famous for wrought iron, and 'Iron Mad' Wilkinson's Bradley works. After Bilston Road you'll have the privilege of coming across the derelict Chillington Basin, Grade II listed and the only surviving canal / railway interchange on the Main Line. Its Babcock and Wilcox travelling crane was surprisingly still operating up until 2000. Further on, a BOC depot has gas cylinders lined up as far as the eye can see and opposite is the impressive building that housed Wolverhampton's first power station. After Walsall Street Bridge, Pickfords Wharf was on the other side of the canal which had fly boats to many destinations operating day and night, and further on there's the site of the former Minerva Iron and Steel works. The 'curly wyrley' Wyrley and Essington canal joined at Horseley Fields Junction in 1797.Just over a quarter of a mile past this junction, you'll see the former Cheese and Butter Warehouse and Albion Mill, which would have been part of a collection of wharfs, mills and warehouses, including Albion Wharf from where Fellows, Morton and Clayton operated and Union Mill which was demolished after a fire in 1989. Instead of the collosal amount of industry that once blanketed the canal that you've just walked along, now modern apartments line the tow path before the Wolverhampton Tunnel, a very impressive brick lined edifice. Just before Broad Street Basin, with its FMC paintwork still intact even though it's now a night club, look high to the left and you'll see the wonderful Chubb building. 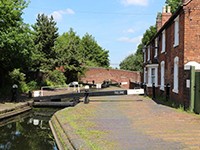 There are pleasant moorings and an original BCN lock cottage before the first of 21 Wolverhampton Locks that descend 132ft and, with one or two exceptions, very pleasant they are too. In fact by the time you reach the bottom lock, the atmosphere at Aldersley Junction is positively bucolic. This is the summit of the Staffs and Worcester Canal with the Severn to the south and the Trent in the opposite direction. The Main Line arrived here in 1772 and the foundations of a collection of buildings that would have included stables and a wharf can still just be discerned dating from when this was a very different scene.